ww2dbaseAmon Leopold Göth was born in Vienna, Austria. In 1930, he became a member of the Austrian branch of the Nazi Party with Party Number 510764; he also became a member of the SS organization of the Austrian Nazi Party at the same time, number 43673. Between 1938 and 1941, he was a member of 11th SS-Standarte based in Vienna. 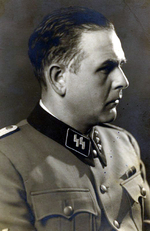 In Aug 1942, he became a member of Odilo Globocnik's staff, who was the SS and police leader of Kraków, Poland. On 11 Feb 1943, he was ordered to oversee the construction of a labor camp at Plaszów, Poland, and upon its completion he became the commandant. During his time at the helm of Plaszów, he allegedly shot over 500 Jews himself. Holocaust survivor and former worker at Plaszów Poldek Pfefferberg commented that "When you saw Göth, you saw death". Beginning on 13 Mar 1943, all residents of the ghetto in Kraków were deported for the camp; 2,000 people would die en route, and Göth was accused of shooting several people during the deportation. On 3 Sep 1943, Göth was tasked with closing down the Tarnów ghetto; several people died during the deportation. In Apr 1944, he became a reserve officer in the Waffen-SS.On 13 Sep 1944, he was relieved of his position as the commandant of Plaszów labor camp and was assigned to the SS Office of Economics and Administration. In Nov, he was accused of the theft of Jewish property, which was considered the property of the government, and was arrested by the Gestapo; he would later be released as the war situation resulted in the inability to assemble a tribunal against him. 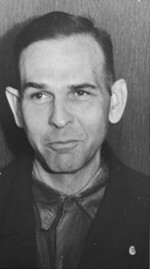 SS doctors diagnosed him with mental illness and diabetes and sent him to a sanatorium, where he would be captured by American troops in May 1945. He claimed to be of the rank of SS-Sturmbannführer, which was later corroborated in Auschwitz Concentration Camp commandant Rudolf Höss's testimony, but his official service records never indicated such a promotion. Between Aug and Sep 1946, he was tried by the Supreme National Tribunal of Poland at Kraków, Poland and was found guilty for the murder of tens of thousands of Polish people. He was executed by hanging in Sep 1946 a short distance away from the Plaszów labor camp. Although a platform was purpose-built for the hanging, the executioner twice miscalculated the length of rope necessary to hang Göth, and it was only the third time that he was successfully executed. 11 Dec 1908 Amon Göth was born in Vienna, Austria. 14 Jul 1941 Amon Göth was promoted to the rank of SS-Untersturmführer. 11 May 1942 Amon Göth ordered the Jewish council of Szczebrzeszyn, Poland to pay 2,000 zloty and 3 kilograms of coffee as payment for the cost of the ammunition that would soon be used to execute the local Jewish people. 11 Feb 1943 Amon Göth was assigned to oversee the construction of the Plaszów labor camp in Poland. 1 Aug 1943 Amon Göth was promoted to the rank of SS-Hauptsturmführer. 3 Sep 1943 The Jewish ghetto at Tarnów, Poland was closed and its residents deported; Amon Göth was placed in charge of the deportation. 3 Feb 1944 The concentration camp at Szebnie, Poland was closed, and its prisoners deported or executed; Amon Göth was placed in charge of this operation. 20 Apr 1944 Amon Göth was given the rank of SS-Hauptsturmführer in the reserve forces of the Waffen-SS. 13 Sep 1944 Amon Göth was relieved of his position as the commandant of Plaszów labor camp and was assigned to the SS Office of Economics and Administration. 27 Aug 1946 The trial against Amon Göth at the Supreme National Tribunal of Poland began. 5 Sep 1946 The trial against Amon Göth at the Supreme National Tribunal of Poland ended. 13 Sep 1946 Amon Leopold Göth was executed by hanging in Poland.